Posted by Teresa Mihelic HelpDesk on Monday, July 1st, 2013 at 8:44pm. 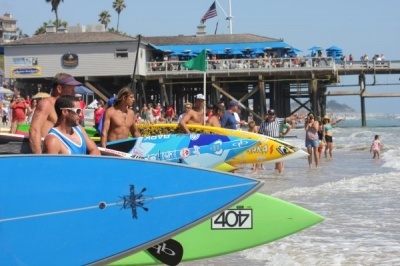 The annual San Clemente Ocean Festival is coming to the Pier area this July 20th an 21st, 2013, when sea athletes come for surf, surf lifesaving, SUP (stand up paddle board), kayak, and other sports like swimming, running, etc and compete in the California Waterman and Waterwoman Championships. Top athletes include former US Olympian Mitch Kahn. Parking and shuttles will be available at San Clemente High School from 6:30am to 8:30 pm ( complimentary). Don't forget, the Metrolink also stops right there at the Pier, what a great excuse to come and check out this event! Photography by San Clemente Times - 2012.